Choosing a vehicle for a student is never an easy task; the college lifestyle has unique demands that most daily commuters don’t experience. Here are a few reasons to consider taking the 2018 Jeep Compass to campus. You’ll need a vehicle with plenty of storage if you’re going to be moving back and forth between campus and home every summer and over the winter holidays. The 2018 Jeep Compass is specifically designed to offer as much cargo space as possible. This SUV features an available adjustable cargo floor, which facilitates the simple loading of gear by moving it up and down on demand. You’ll also have access to 60/40 folding seats, so you can fit plenty of your gear in the rear when it’s time to head back to school. You may have chosen to go to college in another state, where weather patterns are very different from what they are at home. The 2018 Jeep Compass will prepare you for any eventuality; it’s Trail Rated to perform in a variety of off-road scenarios. You may or may not need to hit the trails in your new Jeep, but you’ll be grateful for its capability during a heavy winter storm. With available features like a Selec-Terrain Traction Management System, windshield wiper de-icer, rain-sensing wipers, and heated mirrors, the new Compass makes it easy to drive in the snow. Don’t worry about showing up on campus with a clunky old hand-me-down; the 2018 Jeep Compass sports an aerodynamic design, assertive stance, and sculpted accents. This will help you stand out in a sea of sedans and compacts. The Compass also features LED signature lighting and a unique headlamp design. You can even opt for additional gloss black paint on the roof, wraparound chrome details, and a variety of different-sized wheel options. Your family will be happy to know you’re driving with the safety features of the new Compass at your disposal. The SUV uses modern technology like lane departure warning, lane-keeping assistance, blind-spot monitoring, and forward collision warning software to help you avoid accidents. Additionally, features like adaptive cruise control and automatic high beams make the trip to and from campus a breeze. 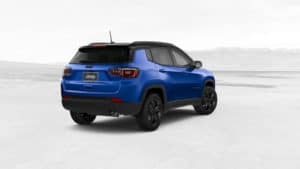 The 2018 Jeep Compass has also received a four-star rating from the National Highway Traffic Safety Administration, which indicates excellent performance in crash test results. Don’t give up your favorite entertainment devices when you get behind the wheel. The 2018 Jeep Compass is capable of connecting to both Android and Apple devices to keep your music playing while you’re on the road. You can also make hands-free phone calls on the long trip back home, and the available navigation software is sure to help you find your way around town when you’re first getting adjusted to your new school. Consider exactly what features you’ll need in your car when you arrive on campus. Chances are good the 2018 Jeep Compass has them all. Check out our current inventory to get started today.